Symphonic Metal still has good surprises for all of us, the fans and the Metalheads that don’t like the style. Yes, because some bands are really creating excellent and great albums, and making a different form of the style that we all are used to hearing. 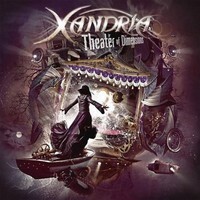 One name that is really doing great is the German band XANDRIA. Their new album, “Theater of Dimensions”, is really amazing. The greater differential of their work is the use of modern and aggressive tunes on guitars, bass guitar and drums, mixing them with their symphonic elements and great orchestrations. Their songs are really beautiful, done with extreme care on the musical arrangements, but without losing the heavy grasp they always have. Joost van den Broek is the album’s producer, as well the one who worked on the recording and mixed it, having Marco Heubaum as co-producer. The mixing is from Darius van Helfteren. The result is an excellent sound quality, giving the needed clarity for us to understand the complexity of their songs and musical arrangements, but with weight and aggressiveness in the due moments. The album presents as well some great guests: Ross Thompson doing vocals on “Ship of Doom”, Zaher Zorgati singing on “Burn Me”, the aggressive voice from Björn “Speed” Strid of SOILWORK on “We Are Murderers (We All)”, Henning Basse on “A Theater of Dimensions”, Valerio Recenti on additional backing vocals. The album’s producer, Joost, plays parts of keyboards and does the narration on “A Theater of Dimensions”, and on the instrumental parts we have Ben Mathot on violin, David Faber on cello, and Johannes Schiefner on uillean pipes. The album is truly excellent from its beginning to its end. But you can have great moments on “Where the Heart is Home” (a bit more conventional in terms of Symphonic Metal, with very good vocals and choirs), the excellent tempo changes of “Death to the Holy” (very good work from bass guitar and drums, indeed), the beautiful and warm “Forsaken Love” (very good keyboards parts), the extremely aggressive guitar riffs and violent grasp of “We Are Murderers (We All)” (even keeping the symphonic aspect, we have a bitter and harsh Extreme Metal influence here), the perfect mix between aggressive guitar parts with excellent keyboard orchestrations on “Ship of Doom” and on “Burn Me”, and the long and filled with intricate instrumental parts and very good vocals “A Theater of Dimensions”. What is left to say anymore? Excellent work!